Puente de Oro Society honors individuals who have remembered the University of San Diego through a planned gift. "Puente de Oro" is Spanish for "Bridge of Gold." It signifies gifts of extraordinary generosity from one generation to another. The members of this giving society demonstrate their commitment to USD's educational mission. Through such benevolence-which is not marked by levels of giving, but by generosity of spirit-planned giving donors ensure that USD will continue to excel, meeting higher aspirations with every graduating class. 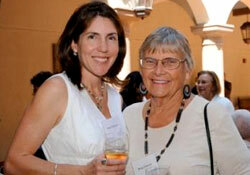 Puente de Oro Society members are recognized at an annual lunch reception held by Planned Giving. Members can choose to be recognized in university donor publications or to remain anonymous.